Home Article LOOK: Paolo off the hook in House probe on ‘shabu’ smuggling. Trillanes Failed Again. 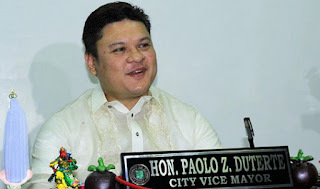 Presidential son and Davao City Vice Mayor Paolo Duterte found yesterday an ally in the House Committee on Dangerous Drugs after the panel decided not to include in its 52-page final report his alleged involvement in the P6.4-billion shabu smuggling. “Kaya ini-emphasize namin diyan sa komiteng yan na hindi kami nag-e-entertain ng tsismis. Kami ay nakatutok sa usapin ng droga. We do not entertain hearsay. And we do not give way to testimonies that are hearsay and bunga ng isang tsismis kaya hindi namin yan pinapansin. (We emphasize that the committee will not entertain rumors. We are focused on the drug issues. We do not entertain hearsay. And we do not give way to testimonies that are hearsay and are just rumors, we will just ignore them),” Barbers said in a radio interview. 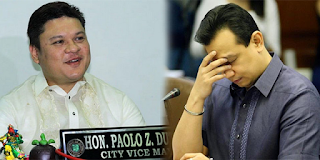 During congressional inquiries, Taguba repeatedly tagged Duterte as involved with a certain Davao Group, which was supposedly involved in illegal activities at the Bureau of Customs (BOC). “Eh tinanong namin kung siya ay may direct involvement, personal experience dyan sa sinasabi niyang kay Vice Mayor Duterte. Eh sinabi niya na wala ho. Eh bakit mo nababanggit si vice mayor? Eh yon lang ho ang sinabi sa akin, tsismis lang ho. (We asked him if he has direct involvement, personal experience on his claim against Vice Mayor Duterte. He told us, there was none. Why did you mention the vice mayor? That’s what mentioned to me, just hearsay),” Barbers said. Taguba said he never transacted with Duterte, only with his alleged middlemen. Barbers said there is no stopping them from passing their panel report recommending the filing of criminal and/or administrative complaints against former Bureau of Customs (BOC) Commissioner Nicanor Faeldon and other BOC officials on Tuesday. He expects that by next week, the committee report will be endorsed for plenary discussions and approval.